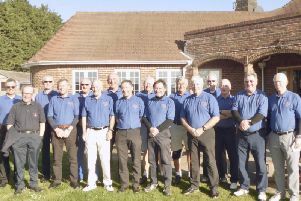 Worthing Petanque Club played host to 42 teams from Sussex and surrounding counties for its annual charity fundraising event. This year’s charity, Guide Dogs for the Blind, was chosen by club members and the event raised more than £500. Miriam and John, who are visually impaired, attended with their dogs Bradley and Ellie and were presented with the cheque by treasurer Keith Rutter. Worthing Petanque Club plays at West Worthing Club in Titnore Way. Visit www.worthingpetanqueclub.org.uk for more information.